Charlie: I like having you for my brother. 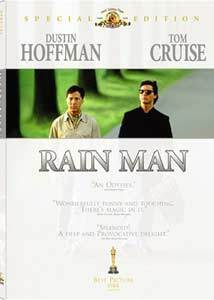 Fifteen years after its initial release, the many strengths (and some weaknesses) in Rain Man seem to be in even more bold relief, and this well-produced special edition DVD is unlikely to sway your thinking�if you find it a genuinely moving tale, one worthy of being covered in Oscar glory, you'll be persuaded all over again; if you think it's a manipulative bit of Hollywood falsity, it's not going to ring any more true for you. I admit to being much more in the former camp than the latter�this is one of those movies where, as an audience member, you're conscious of being manipulated, but the movie is made so smartly and slickly, and by professionals working at such a high level, that you still, literally, want to go along for the ride. Charlie Babbitt (Tom Cruise) is in a bad way�his business selling grey-market Lamborghinis is falling apart, his girlfriend (Valeria Golino) just barely tolerates his temper, and if he doesn't come up with some slick talking and some cash in a hurry, the whole enterprise is going to go kablooey. And with that comes a phone call: back home in Cincinnati, Charlie's father, from whom he's been estranged for years, has died. Mom predeceased Dad, and Charlie goes through the rites of mourning merely as a formality to get to the reading of the will, but the old man has pulled a fast one: aside from a sweet old car and some prize-winning rosebushes, Charlie has been disinherited. The bulk of the Babbitt estate is left to an unnamed heir, and Charlie is filled with rage. His silver tongue and his greed lead him to some answers: previously unbeknownst to Charlie, he's got an older brother. Raymond (Dustin Hoffman) is an autistic savant, living at a nearby facility for those with disabilities; the $3 million estate has been left to someone who doesn't understand the concept of money. So Charlie kidnaps him, and the second act of the movie is an odd road movie/buddy comedy of sorts. Hoffman's is the show part, of course, and he's uncanny in the specificity and accuracy in his portrayal of Raymond. The danger of a part like this, one that's an obvious bit of Oscar bait, is for it to be all emoting and self-pity�look at me, I'm acting! (Of course, I don't have my underwear.) But Hoffman fully inhabits this guy, who needs to eat his cheeseballs with toothpicks, who, when he's anxious, recites the Abbott/Costello "Who's on first?" routine, who is a man of limited capacity; Raymond can't understand his own emotions, he can't function in the world without his rituals and repetitions, yet Hoffman doesn't overly sentimentalize the character. We come to have a tremendous affection and empathy for Raymond. But the appeal of the story is also what gives it its limits�fundamentally, Raymond isn't capable of change, and movies aren't about people who stay the same from the beginning until the end. Which is why the underappreciated performance in the film, in many ways, is Cruise's. He has to set the tone for every scene; he has to push the story forward; he has to provide us with all the necessary information; he's the one who changes�in short, he's our hero. As an actor, that's a hell of a mantle he's asked to carry�Hoffman gets to do his little arias about Wapner, while Cruise has to make sure that the movie has a motor. On a performance level, Cruise is sort of handicapped by his voice, which sound especially thin and reedy here; but he actually makes it all work, and even if Charlie is only slightly less of a self-absorbed jerk at the end of the picture, we come to feel for and with him. You can feel the machinery creaking at times�the Babbitts' trip to Vegas is especially egregious, and at moments like these, it's hard not to draw unflattering comparisons between Rain Man and one of its contemporary films with an equally unlikely family pairing: Twins. Barry Levinson's direction, though, does a smart job of smoothing out many of the rough spots, and this is recognizably a Levinson picture�the patter of the characters has the ring of truth to it, and Charlie is a cinematic cousin to the guys in Diner and Tin Men. The running time is probably a good thirty minutes too long, and toward the end especially, you may find yourself a couple of beats ahead of the characters. But it's worth sticking around, not just for the conclusion of Charlie's emotional journey, but for a cameo by Levinson himself, as a court-appointed psychiatrist who will be deciding Raymond's fate. Image Transfer Review: Some flecks are evident in the print; John Seale's photography still looks handsome and professional, but the movie could have used a bit of extra TLC in the transfer. This looks like basically the same transfer used for the previous, no-frills DVD release of the movie. Audio Transfer Review: This is a sharp, full 5.1 audio track, and Hans Zimmer's percussive score provides a lot of the propulsive energy for the story. Balance is sometimes a little off�it's a reminder that this was produced in the age of Miami Vice—but it's a pretty clean transfer. It's also clear that a huge amount of the dialogue was looped and laid in after production, especially given Levinson's predilection for long shots. Extras Review: It's the three, count 'em, three commentary tracks that make this special edition, well, special. Director Barry Levinson provides the first, in a track ported over from a previous laserdisc release of the title�it didn't make it onto the first DVD release. Levinson is smart and pleasant when he's talking, but unfortunately that's not often enough; there are many dead patches in this track, and it's a lot of the usual stuff, about problems with location shooting and how he came to direct the picture. Far more informative and lively are the tracks from the two credited screenwriters. Barry Morrow was the first writer on the project, and he talks about his first-hand experience with people with autism; he's also pretty funny describing studio executives who were dismissive of the project. One studio didn't want the project because they had another film in development that they thought would be too similar: Forrest Gump. And Morrow is hilarious imagining how these guys characterized his sensitive script: "A retard riding around in a car with his brother." This is also a reminder of the glory days of �ber-agent Mike Ovitz, who originally thought that Hoffman should play Charlie, and that Bill Murray should play Raymond. Also on hand are a deleted scene of Raymond helping himself to cheeseballs in a convenience store, and a featurette (06m:54s) from the time of the original theatrical release, featuring interviews with Cruise, Hoffman, Levinson, producer Mark Johnson, and executive producers Jon Peters and Peter Guber, the latter of whom praises the movie for its "synergism," whatever that means. It's hard not to have a sentimental attachment to Rain Man, and this disc sheds light on its genesis, and on the Byzantine Hollywood machinery that gave birth to it. Bet two for good.